There are four volumes in this series on organophosphorus chemistry, a sub-series of Saul Patai's Chemistry of Functional Groups series. Together the volumes provide comprehensive coverage of the entire organophosphorus area, which is critical to main-line organic chemistry in both academic and industrial circles. The general format of the material on organophosphorus chemistry follows that of the volumes in the Patai series, with commissioned chapters on the theoretical/structural aspects, stereochemistry, synthesis, photochemistry, spectroscopy and biochemistry. Frank R. Hartley is the author of The Chemistry of Organophosphorus Compounds: Phosphine Oxides, Sulphides, Selenides and Tellurides, Volume 2, published by Wiley. Saul Patai is the author of The Chemistry of Organophosphorus Compounds: Phosphine Oxides, Sulphides, Selenides and Tellurides, Volume 2, published by Wiley. Structure and Bonding in Phosphine Chalcogenides (D.Gilheany). Structure and Stereochemistry of Secondary and Tertiary PhosphineChalcogenides (M. Gallagher). Electrochemistry of Organophosphorus (5) Compounds (K.Santhanam). Photochemistry of Phosphine Chalcogenides (M. Dankowski). Spectroscopy of Phosphine Chalcogenides (G. Davidson). Methods of Preparation of Phosphine Chalcogenides (A. Bhattacharya& N. Roy). 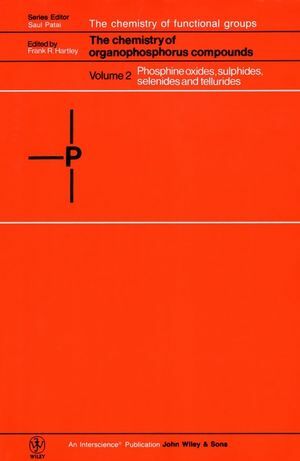 Chemical Properties and Reactions of Phosphine Chalcogenides (R.Edmundson). Coordination Chemistry of Tertiary Phosphine Chalcogenides andTheir Analytical and Catalytic Applications (T. Lobana).